Dodge College is proud to welcome renowned filmmaker Randal Kleiser (“Grease,” “The Blue Lagoon” “Flight of the Navigator”) as the O.L. Halsell Foundation Filmmaker-in-Residence. 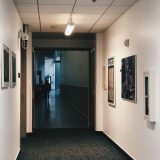 Every semester, Dodge College hosts an expert filmmaker to meet with and counsel students directly, as part of its Filmmaker-in-Residence program. The popular program includes regular, bi-weekly meetings with the filmmaker in a one-on-one setting where the student and mentor have the opportunity to creatively brainstorm a specific project developed throughout the semester as well as weekly dinners with the filmmaker open to students and screenings of the filmmaker’s films followed by an in-class Q & A. Notable industry professionals teaching for Dodge College as Trustee Professors include long time artist and animator Sheldon Borenstein, animation pioneer Dave Master, Academy Award® winning Producer Michael Phillips (“The Sting,” “Taxi Driver”), production executive Madeline Warren, and talent and literary agent Harry Ufland (clients include Robert DeNiro and Martin Scorsese). 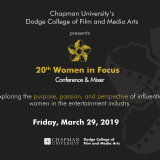 Each is a distinguished working artist whose career and accomplishments bring credibility and visibility to Chapman University and whose expertise is invaluable to its students. New faculty welcomed to Dodge College’s Orange Campus include acclaimed film director Martha Coolidge (“Real Genius”) (Professor / Directing), Emily Carman (Assistant Professor / Film Studies), and Element Pictures President Adam Rosenfelt (Assistant Professor / Producing). New faculty on Dodge’s Singapore campus include director Rod Plummer (Assistant Professor), producer and global media executive Andy Adelson (Assistant Professor), and producer/writer/teacher Rona Edwards (Assistant Professor). Former Assistant Professor Nana Greenwald has been named Associate Dean and Director of the Chapman University Singapore program. Chapman University, founded in 1861, is one of the oldest, most prestigious private universities in California. Chapman’s picturesque campus is located in the heart of Orange County – one of the nation’s most exciting centers of arts, business, science and technology – and draws outstanding students from across the United States and around the world. Known for its blend of liberal arts and professional programs, Chapman University encompasses seven schools and colleges: Wilkinson College of Humanities and Social Sciences, George L. Argyros School of Business and Economics, Lawrence and Kristina Dodge College of Film and Media Arts, Schmid College of Science, College of Performing Arts, School of Law and College of Educational Studies. Named to the list of top universities in the nation by U.S. News & World Report and the Princeton Review, Chapman University enrolls more than 6,000 undergraduate, graduate and law students. One of the premier film schools in the country, Dodge College of Film and Media Arts offers students the unique opportunity to learn filmmaking in a hands-on environment modeled on a working studio. The college is comprised of the Sodaro-Pankey Undergraduate School of Film and Media Arts, offering degrees in film production, film studies, screenwriting, broadcast journalism, public relations and advertising, and digital arts; and the graduate Conservatory of Motion Pictures, offering M.F.A. degrees in film production, film and television producing, and screenwriting, and an M.A. in film studies. Dodge College is housed in Marion Knott Studios, a state-of-the-art, 76,000-square-foot studio and classroom building that provides students with 24-hour access to sound stages, edit bays, Dolby surround mixing, a motion capture stage and more. With an Oscar and Emmy-award winning faculty that boasts more feature film credits than any other film school, Dodge College is where students learn the entertainment business from the inside out.